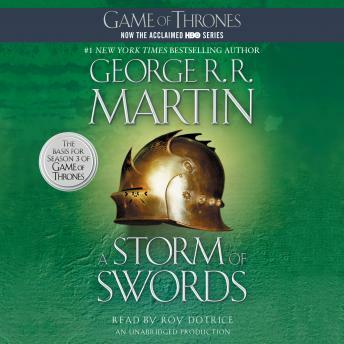 Listen to "A Storm of Swords: A Song of Ice and Fire: Book Three" on your iOS and Android device. I loved this book! Though I wish that there was a faster speed than ludicrous, it just goes way too slow for me. Also, some of the voices Dotrice uses are just awful. Luckily the constant character swapping from chapter to chapter, means that you needn't listen to an annoying voice for too long. Enchanting fantasy novel, only made better by the timeless Roy Dotrice. These books are great, book 3 is my favourite so far! Roy Dotrice narration grows on me. My favorite book in the series (and will remain so until WOW and ASOS are released....Georgie-Boy....). Roy Dotrice does an overall fine job, mispronunciations considered. The North Remembers. Loved everything about this book including the narration. A masterpiece! I love these books. I have the hard copy and I read along sometimes or I'll just listen. The voices of the characters, read by Roy Dotrice, can be spot-on. Other times I cannot stand it, and go back to reading because the slobber and his voice is so repulsive. Iain Glen would be my choice to voice the books Mr. Glen read "The Blacks & The Greens" and it was fantastic. As always great book! I came to know of the book series because of the HBO show. As usual the characters are what drive everything. If you are up to date with the show, take the time to listen to the books. Roy is a master narrator! I don’t understand how he keeps the voices separate. Mr. Doltrice's reading of Fire and Ice is brilliance. His words bring George R.R. Martin's magnum opus to life with a story telling skill that is as epic as the tale he tells. Now we only need to entice Mr. Martin to finish it!